Childrens play kitchen sets are some of the most popular toys for both young girls and boys. While girls love playing house and making the “family” dinner, or hosting those tea parties, boys like to pretend they are a Chef and make those taste tempting mud pies. When you provide your toddlers with a children’s play kitchen set, you open the doors to imaginative play, and some of the first steps they will take towards developing those social skills that will be so important later in life. The Hape Company is a German manufacturer of toys for tots, made from sustainable materials. The Hape Playfully Delicious Gourmet Kitchen Starter Set is an all wood play set that is bound to get your little’s one imagination cooking. This is an exceptionally nice kitchen starter set for toddlers. There are enough pieces to keep them happily busy cooking up a storm, without giving them too many pieces, which would create difficulty for them in keeping track of them all. Reviews for this adorable wooden kitchen set are overwhelmingly positive, with parents who purchased this for their children reporting that their children had great fun playing with the kitchen set. While a few parents did state that they wish the silverware was in keeping with the size of the plates, other parents thought the size of all the utensils made them easy for young toddlers to handle. Overall, parents and children alike adored this beautiful kitchen play set, and were delighted with their choice. ChildCraft is one of the brand names that falls under the School Specialty Company, which makes educational toys that encourage children to build their cognitive, motor, and socialization skills. The ChildCraft Deluxe Kitchen Play Set allows children to increase their motor and hand eye co-ordination skills, as well as helping them to develop their socialization skills. Your children will have a ball preparing food, cooking, serving and even cleaning up after this meal with this colorful and many pieced kitchen set. This set has some very interesting items you don’t find in many other sets, such as a hand beater, a rolling pin and some cookie cutters. Reviews for this kitchen set are extremely positive, with parents liking almost everything about this handy all inclusive set. All in all, this play kitchen set for children was a big hit with parents and kids alike, and will provide any child with hours of fun. Small World Toys is a toy company that focuses on developing and delivering safe and high quality products for children to enjoy, and that parents can trust. The Small World Living Toys Young Cookware Set has been developed with safety, quality and fun in mind. If your child already has a tea or dish set, and you are looking for a few more pans to extend the cooking end of their dish sets, then the young chef cookware set may be a great addition. You do need to keep in mind, that unlike the picture provided, this set does not come with any food. Reviews for the Small World Living Toys Young Chef Cookware Set and are quite good. Some parents were not happy that the food that was shown in the picture did not come with the play set, but in all fairness, the product description does list the items included, and food is not one of them. Still, this could have been made clearer to the busy shopper. In addition, some parents did not like the small size of the pans in this set. However, overall, this does seem to be a popular and well liked cooking set, and most children are reported as being thrilled to receive these pots and pans. Despite the misunderstanding about the food in the image not being included with the kitchen set, the majority of parents loved this set and found that they children thoroughly enjoyed playing with it. Green Toys is a company devoted to manufacturing and distributing fun and innovative toys from recycled and environmentally friendly materials. This means that, not only does this company provide safe and fun toys for your child, but they provide toys that won’t damage the environment. 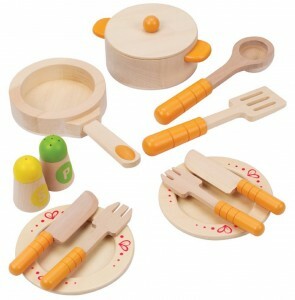 The play kitchen set they offer is the Green Toys Cookware And Dining Set. This is a nice toy cookware and dining set, and it’s good knowing that your child can hold a real tea party as it is safe to serve food on these dishes. The set is colorful and fun, and can easily be added to by purchasing other Green Toy products. Reviews for this cookware set are exceptional. The only real complaint was that one customer stated that if you purchase this company’s dining sets and cookware sets separately, you pay about the same price and get the cooking utensils free. Childrens play kitchen sets seem to be a part of childhood, like jump ropes and building blocks. They are toys that provide children with hours of fun and imaginative play, and are easy toys to help them share playtime with friends and siblings.